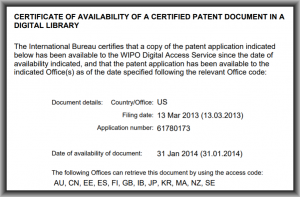 Do you sometimes file a US patent application that claims priority from a Japanese patent application? Do you sometimes give instructions to Japanese counsel to file a Japanese patent application that claims priority from a US patent application? In either case, you need to know about something important that will change on October 1, 2017. 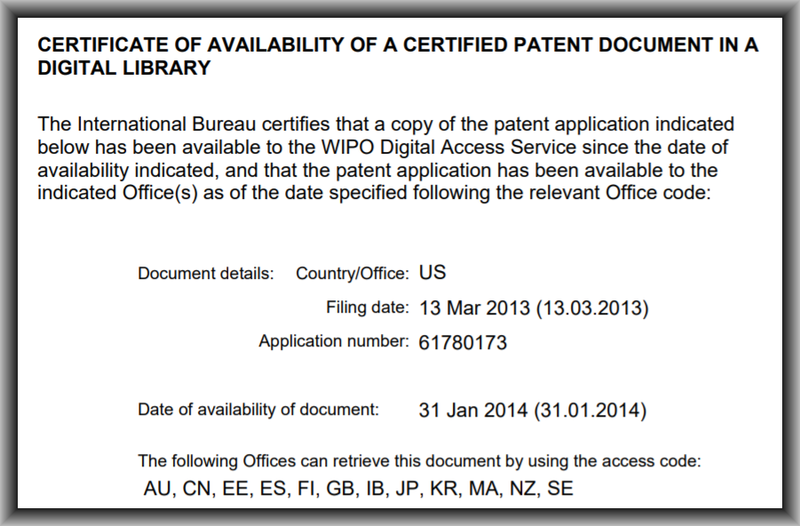 Practitioners in the US and in Japan should learn how to use the DAS portal at WIPO, if they have not already done so. Details: What’s going on here? What’s going on is that on October 1, the JPO and the USPTO will migrate their electronic-priority-document workflow from the PDX system (USPTO web page for PDX) to the DAS system (WIPO web page for DAS). PDX. The PDX (priority document exchange) system has been around since 2007. It is actually not a single system, but is a bundle of several distinct bilateral systems, each between two patent offices. Some of the bilateral systems are depicted at right. DAS. The other system is DAS (digital access system). The DAS system connects any two Offices by means of a path that passes through DAS. 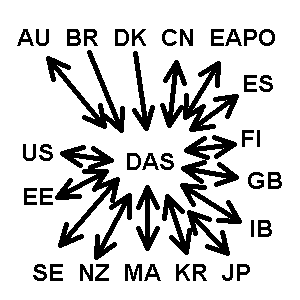 One way to think of DAS, then, is as a collection of sixteen bilateral links (each of sixteen Offices connected with DAS). Why DAS? The overwhelming advantage of the DAS approach over the PDX approach (from the point of view of Offices) is that for another member to join, only one set of meetings and tests needs to take place. For example there are plans that EPO will join DAS soon. For this to happen, EPO’s computer programmers need to conduct meetings and tests with DAS programmers, but they do not need to conduct meetings and tests with the programmers from New Zealand or Korea or Japan and the many other Offices. But there is also an overwhelming advantage of the DAS approach over the PDX approach from the point of view of practitioners. With DAS, the practitioner can independently check the availability of any particular priority application to the DAS system. And with DAS, the practitioner can independently confirm that a particular Office has already obtained an electronic certified copy of a particular priority application. This compares with PDX, where there is almost nothing that the practitioner can do to investigate if something about a priority document transfer has failed to work. Is it the fault of the “from” Office? (Maybe that Office failed to make the document available to PDX, despite perhaps having said that it did so.) Is it the fault of the “to” Office? (Maybe that Office failed to try to get the document from PDX, despite having claimed to do so.) Or is it the fault of the practitioner in the “from” country? (Maybe the practitioner provided a wrong digit in the application number.) Or is it the fault of the practitioner in the “to” country? (Maybe the practitioner typed a digit wrong when providing the application number to the “to” Office.) Put plainly, there are a multitude of opportunities for finger-pointing if there were ever to be some hitch in an effort to transfer an electronic certified copy from one Office to another Office. With DAS, in contrast, the practitioner is able to follow the electronic certified copy at each step along the way. Thus for example suppose I were to wonder whether an electronic certified copy of US application number 61780173 is available to Offices in the DAS system. With a few mouse clicks I can obtain a Certificate of Availability such as the one quoted at right. If the question were to arise why it is that some patent office had not yet retrieved the electronic certified copy (despite having been asked to do so), this COA would eliminate the notion that USPTO was somehow to blame. Our habit at OPLF, when dispatching instructions to foreign counsel to file an application that claims priority from a US application, is to obtain a COA and to send it to foreign counsel. This provides an unambiguous indication of the fact that the US application is actually available in DAS and provides an unambiguous indication of the fact that the foreign Office will be able to retrieve an electronic certified copy. This also provides a very clear indication of the filing date and the digits of the application number. This is particularly helpful in those cases where we are working with a foreign counsel with whom we have not previously worked very often, or where the foreign Office is an Office that we have not been connected with very often. When a foreign firm gives us, at OPLF, instructions to file an application in the US that claims priority from a foreign application, we find it helpful if the foreign firm sends a COA to us. This makes very clear exactly what the application number is and what the filing date is. It also makes clear that the USPTO should have no difficulty retrieving the electronic certified copy. But that’s not all that’s helpful about DAS. From DAS, you can also see whether a particular Office has actually obtained an electronic certified copy. Suppose a question were to arise as to whether, say, the IB had or had not successfully obtained an electronic certified copy of the US priority application just mentioned above? If such a question were to arise, it could quickly be put to rest with the report quoted at right, which makes clear that the IB did successfully retrieve the electronic certified copy on March 14, 2014. There are many, many other very helpful features in the DAS system. This blog article only focuses on two of them. Try out the DAS system yourself. You will find for example that DAS provides a way that you can arrange to be automatically notified when an Office retrieves a electronic certified copy of one of your priority applications. And you will see that DAS permits you to set up a sort of “tripwire” that will let you know if you are not the only person watching to see when some Office retrieves a particular electronic certified copy. 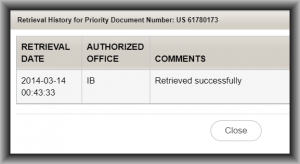 What if both paths are available for a particular electronic certified copy? The alert reader will already have seen that the pair of Offices “US and JP” can be seen not only in the PDX diagram above but also in the DAS diagram above. This raises the question of which path the USPTO would use to obtain an electronic copy if more than one path is available. Until now, the USPTO has said that when two paths are available, the path that USPTO will use is the PDX path. Thus, for example, until now, when USPTO has sought to obtain an electronic certified copy from JPO, USPTO has used PDX even though it could have used DAS if it were to wish to do so. What exactly will happen on October 1 for the JP migration? This fact that US and JP have already both belonged to DAS for a long time helps to show what exactly will happen on October 1. USPTO (and JPO) won’t have to actively “turn on” some new system. Instead, all that USPTO will need to do is to “turn off” the PDX link to JPO. For practitioners, the only readily visible difference on October 1 is that starting on that day, the US practitioner will need to supply a DAS access code in the Application Data Sheet. But what practitioners need to realize is that the helpful features of DAS, such as the Certificates of Availability, will for the first time be available for transfers of electronic certified copies between USPTO and JPO. 4 and 16. It will be recalled that to perfect a priority claim, the practitioner needs to make sure that a certified copy of the priority application actually arrives at the Office. It is not enough that the practitioner asked the Office to retrieve the electronic certified copy. The practitioner needs to watch closely to make sure that the Office actually receives the electronic certified copy. In the USPTO, for example, the rule for utility patent applications is that the electronic certified copy needs to arrive by four months from the filing date, or sixteen months from the priority date, whichever is later. This requires docketing. The practitioner needs to docket closely to check to make sure the USPTO actually retrieves the electronic certified copy by the 4-and-16 date. If a practitioner fails to keep on top of this … if the 4-and-16 date comes and goes without the certified copy having been successfully lodged with the second Office … then the practitioner may find it necessary to file an expensive petition to obtain forgiveness for having failed to provide the certified copy timely. Worse, if the practitioner snoozed through it all the way to the issuance of the patent, the result could be a complete loss of the priority claim. Does the blame lie with the US practitioner? Did the US practitioner mistype a digit of the priority application number in the ADS? Did the US practitioner mistype the country code in the ADS? Did the US practitioner mistype the priority filing date in the ADS? Did the US practitioner mistype the Access Code in the ADS? Or does the blame lie with the Office where the priority application was filed? Did that Office somehow fail to make the application available for electronic retrieval? Did that Office somehow report an incorrect Access Code to the foreign practitioner? Or does the blame lie with the USPTO? Did the USPTO actually already successfully retrieve the electronic copy of the priority application, but failed to get it into IFW? Does the USPTO claim incorrectly that the priority application was not available in DAS? Or does the blame lie with the foreign practitioner? Did the foreign practitioner provide an erroneous priority application number? Did the foreign practitioner provide an erroneous priority filing date? Did the foreign practitioner provide an incorrect Access Code? From the above discussion, it may be appreciated that it would only require a few mouse clicks in DAS to very quickly work out exactly where the problem lies in a failed retrieval of an electronic certified copy of a priority document. Over the years we have had instances where a PDX retrieval of an electronic certified copy went wrong, and what came next was finger-pointing all around. We have had instances where six or more emails and telephone calls were needed to eventually work out who had to do what so as to get the electronic certified copy from point A to point B. With DAS, there is almost no opportunity for finger-pointing. With DAS, it is a straightforward matter to work out which of a dozen possible explanations for a retrieval failure is the actual explanation. From this discussion it is clear that every US practitioner ought to learn how to use DAS and its many helpful features if he or she has not already done so. 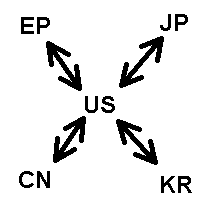 This October 1 migration of the US-JP relationship from PDX to DAS is thus a helpful wake-up call to US practitioners about this. What’s next for DAS? I understand that there are many exciting things in the near future for DAS. One important development is that Real Soon Now, EPO will join DAS. This will be very helpful in many ways. US practitioners who previously relied upon PBX as their way to obtain electronic certified copies from EPO will be able to use the many features of DAS to monitor the availability and successful retrieval of the applications. And many, many Offices that had previously not been able to retrieve electronic certified copies from EPO will suddenly be able to do so. Importantly, these many benefits will not require, for example, that EPO computer programmers conduct meetings and tests with programmers from (say) Brazil or New Zealand. They will only have to conduct meetings and tests with DAS programmers. When the link between EPO and DAS is turned on, this will instantly provide links to the more than a dozen already-established members of DAS. As soon as EPO gets set up with its link to DAS, I understand that USPTO will shut down the PDX link between USPTO and EPO (just as it will have done with the link between USPTO and JPO on October 1). Similarly I understand that USPTO has plans to shut down the PDX link between USPTO and the Chinese patent office (SIPO). I expect that what would follow as well is a shutdown of the PDX link between USPTO and the Korean patent office (KIPO). Eventually PDX would cease to exist. What other Offices would you like to see joining DAS? My own personal wish is that the Canadian patent office would join DAS. If you’ve got an Office that you wish would join DAS, post a comment below and mention the Office. Designs. Thus far in this blog post, I have talked only about utility patent subject matter. But one of the good-news things about DAS is that it will soon be available as a way of retrieving electronic certified copies of industrial design applications. For example China and Spain have started making industrial design subject matter available in DAS. Snoozing through. What will happen to US practitioners who snooze through this October 1 transition regarding USPTO and JPO and PDX and DAS? A first warning sign would be the arrival of a Filing Receipt from the USPTO which says “no access code provided” next to the listing of the Japanese priority claim. When the Filing Receipt arrives with these four words, the practitioner needs to get to work remedying this lapse. There are several ways to do this. One way would be the use of Form PTO/SB/38. Another, probably better way, would be the use of the eADS (the electronic ADS available through EFS-Web). Another warning sign would be the arrival of an Office Action in which Box 12 was not checked. What you want is that the Examiner checks Box 12 to indicate that the Examiner has confirmed that the necessary certified copy is in the USPTO file. Starting now, when you are receiving instructions from foreign counsel to file a US application claiming priority from a foreign application, check to see if the country is a DAS member. If it is (which includes Japan), make sure to obtain the Access Code from foreign counsel and insert the Access Code in the ADS. Obtain a Certificate of Availability from DAS. This permits you to be very sure that you have the correct Access Code, and that you have not mistyped anything in the ADS. Perhaps foreign counsel will provide a Certificate of Availability to you. If so, then use the information from the COA when completing your ADS. Docket closely to make sure that the USPTO actually retrieves the electronic certified copy well within the 4-and-16 time period. Starting now, when you are dispatching instructions to foreign counsel to file a foreign application claiming priority from a US application, check to see if the country is a DAS member. If it is (which includes Japan), make sure to provide the Access Code (the Confirmation Code) to foreign counsel. Preferably, provide a Certificate of Availability to foreign counsel. Docket to check DAS to see whether the foreign Office has timely retrieved the electronic certified copy from DAS. No, sorry, that’s not it. So there’s still an opportunity for someone to win the prize. We have a winner. Congratulations to Sharon!